YouTube is a great place for kids to learn new things and find things that are just entertaining in general. Kids these days can spend hours on YouTube, often watching things that we parents just don’t understand the appeal of. However, it can be a very scary place, as there is a ton of inappropriate content throughout the platform. So many videos are uploaded every day, that it would be impossible for a company to keep up. That is why I was so excited when YouTube Kids was released. Finally, there was a curated place for kids to go and find videos to watch, where I didn’t have to constantly watch over their shoulder. While I still don’t let them watch for hours, I at least feel much more confident they won’t accidentally find a video I don’t want them to watch. What is YouTube Kids like to use? YouTube Kids has a very simple user interface that makes it incredibly easy for kids to use. When you first install the app, it wants a parent to set it up. It will ask you the year you were born to make sure you are old enough to configure the app. I promise it won’t actually reveal your age to anyone. Then it will teach you how to block or report various videos. They try their best to curate the content, but some things will slip through the cracks. Blocking and reporting the inappropriate content can only help the app learn more and improve. Next, the app will ask you to log in with a Google account. Choose your own Google account to get it set up. Don’t worry, all of those toy opening videos won’t show up in your personal watch history. Now you are ready to create a profile for your child. You only need to enter your child’s name and birth month and year. One nice thing is that it won’t automatically set a content level based on this information. The next screen will allow you to choose a “younger” or “older” content experience. The Younger setting will be more restrictive, while the Older setting will offer a few more options for your kids. In either setting, you can choose to turn the “search” on or off. Once your child’s profile is all set up, you can still access the settings and a timer. To access the settings at first, you will have to complete a simple math problem. Then you can set your own PIN, which I would definitely recommend, especially for smart kids that understand math… or have access to a calculator. Once you load up your child’s profile, they can explore videos through different categories like Music, Learning and Shows. I would love to see in the future the ability to restrict different video sections to different time limits. Like I don’t mind if they spend a couple hours on learning videos, but I don’t want them to spend very much time on the standard shows. The user interface is clean and fun, to really help them find exactly the videos they want to watch. What should parents watch out for? The big thing here is that you shouldn’t just trust that YouTube Kids will ALWAYS have appropriate content. As mentioned previously, things can slip through the cracks, so it is important to make sure they know to come and talk to you if they happen to see something they shouldn’t. Also, teach them how to report the content or block the channel as well. The other potential problem is that Boomerang does not report on the videos viewed through YouTube Kids, only the videos watched through the main YouTube app. So you will have to just keep your eye on them when they are using it. I actually really love YouTube Kids. 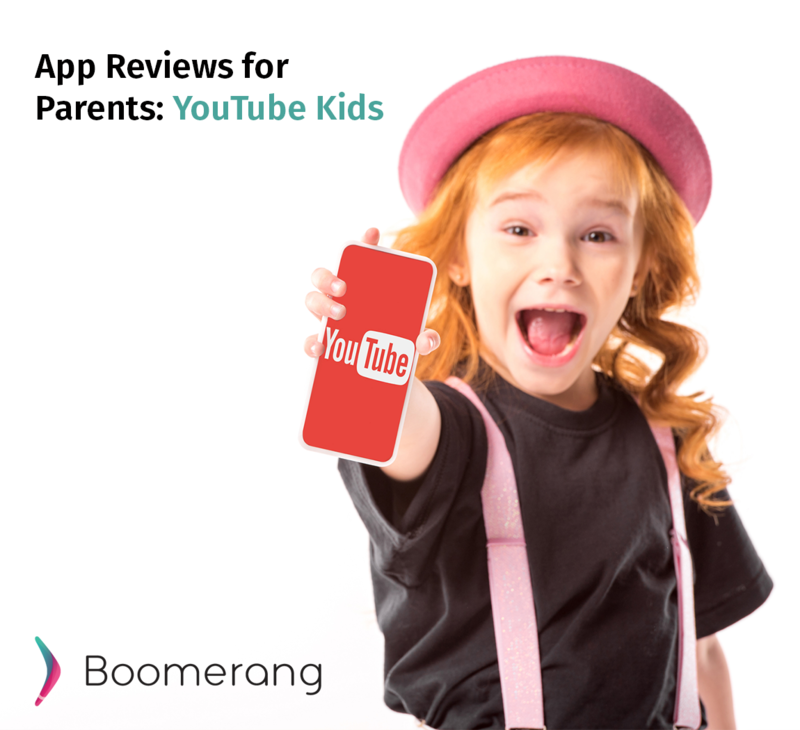 Through Boomerang, for my younger kids, I will block the main YouTube app, and only allow access to YouTube Kids. I feel comfortable with the content they are able to access through the app, but I also realize technology can fail from time to time. Nothing is foolproof. I do rest a little easier though knowing they are only browsing around through the limited app.